April 13, 2014 By Robert Campbell & filed under All Articles, Shotguns, Weapons. Perhaps the M5’s ideal niche is as a truck gun—just in case. In today’s world, we seldom get more than we pay for. Many of us have been around firearms long enough that we sometimes suffer a bit of sticker shock at the gun shop. With a good 1911 at around a grand and a middle priced AR-15 rifle at about the same, the shotgun doesn’t always get the attention it should. A cheap shotgun will not perform to standard, and the problem-solving attributes of the 12-gauge are wasted if the shotgun doesn’t work well. Just the same, many of us have family obligations that include a mortgage and attempt to put something aside in the 401K. The firearm that is with us most often is the handgun, the weapon of opportunity, ready to spring into action to defend our life. The shotgun may be seen as a backup, so we don’t practice as much with it. If you desire a good used Marine shotgun with stainless barrel or corrosion-resistant finish, the ticket price is pretty high—if you’re lucky enough to find one for sale. I was recently canvassing the gun shops with no real goal in mind, and noticed that once-common pump actions are rare in the used rack. It’s difficult to find a good used Remington 870 or High Standard Flite King. Looking over the rack at the shop, I spied a nickel-finish shotgun with heat shield and SPEEDFEED® stock. Examining the Armscor/Rock Island Armory M5 shotgun more closely revealed that it resembles the Mossberg 500 in general outline and features a jeweled bolt similar to the Mossberg. But it also exhibits characteristics of the High Standard Flite King. I was soon the owner of a Rock Island M5 shotgun, and my bank account was down by less than $250. This modest sum gave me a pump-action shotgun with five-shell capacity in the magazine, SPEEDFEED stock that holds two shells, heat shield, and smooth action. The sight consists of a single bead near the muzzle. The barrel is 20 inches long and features an open choke. The synthetic stock fit the shotgun well with no excess motion or rattling in the forend. The finish seemed evenly applied. I cannot comment on durability and corrosion resistance in the long term, but after a few months use and a sojourn behind the truck seat, the finish seems appropriate for hard use. Nothing has broken. I have fired the shotgun a goodly amount—more than I first intended, for reasons I will make clear later. Bolt is well finished and lockup is tight. The test commenced with a good supply of 12 gauge #7½ birdshot. 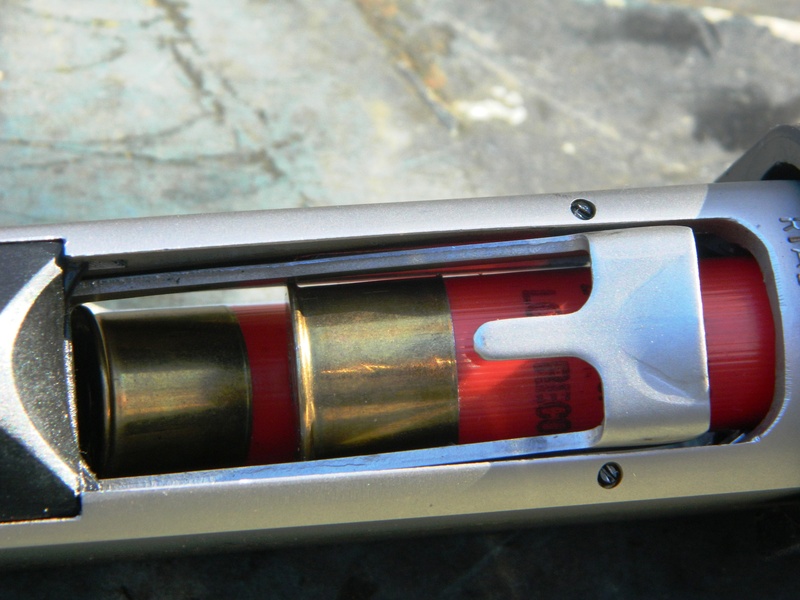 I begin any test of a 12-gauge shotgun with light loads, simply to gauge the action and feel of the shotgun before advancing to heavier loads. Make no mistake, birdshot is not a defensive load at any range. Penetration even at short range is poor. Still, birdshot is a good training aid. The M5 shotgun points as well as any other pump shotgun. The action seems smooth enough and overall all seemed well with the shotgun for the first 50 shells, with a few rounds of Winchester LEO reduced recoil buckshot mixed in. The only real problem was that the safety was rather stiff. Several dozen manipulations later, it was in the heavy normal range. Soaking with oil and further manipulation helped, but the safety is still stiff. 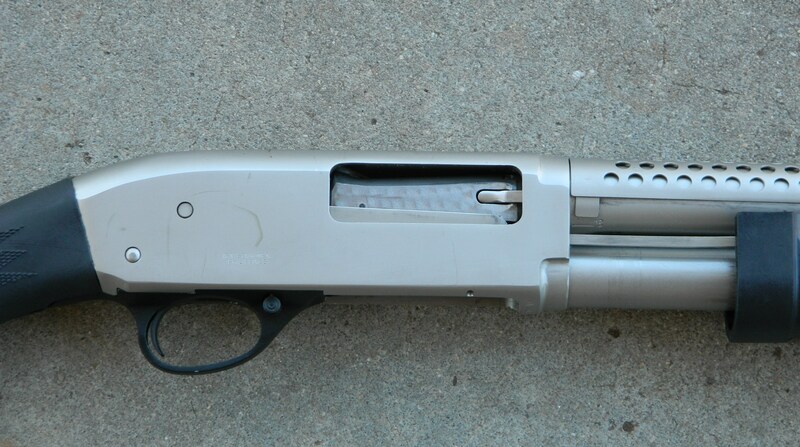 The trigger action breaks at 7.75 pounds—acceptable for a pump shotgun. 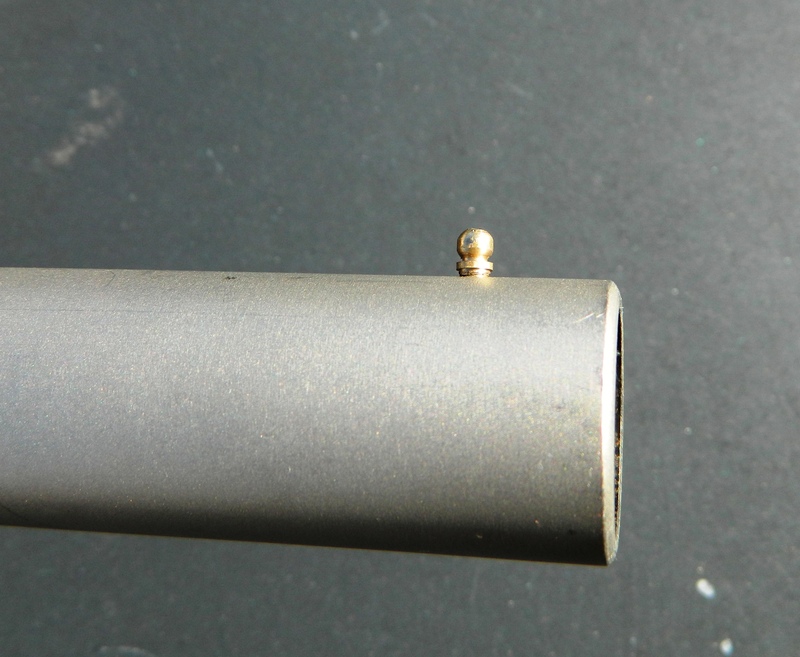 I also noticed the screw that holds the heat shield in place had burrs around the edges, as though someone used the wrong size screwdriver when it was attached. I expect better from a new firearm regardless of price. Testing continued with full-power buckshot. While recoil is nothing to minimize in the shotgun, it may be controlled with proper technique. By leaning into the shotgun and controlling recoil, may manage the jolt and put the load on target. M5 is equipped with a simple bead front sight. It works well for short-range defense. During testing, the shotgun suffered a feedway malfunction. I carefully considered the problem. I cleared the malfunction by reaching into the skeletonized carrier and pressing the lower shell back into the magazine until it caught. In other words, the upper shell was heading toward the chamber while the lower shell had popped out and was retarding movement of the shell carrier. I won’t tell you I fired the gun every day or anything of that nature, but I took it on range trips and fired the shotgun with several types of shotgun shells over several weeks. Most buckshot loads gave good tight patterns, a few inches over the front bead at 15 yards. The M5 also shoots well with slugs, landing most about half an inch over the bead at 15 yards. When you choose the load for any shotgun, choose a credible loading. Pattern the shotgun. Patterning is the zeroing of the scattergun. You don’t want it to scatter too much—the pattern should be centered. I hammered out a number of loads in the shotgun, including the major domestic brands, Wolf buckshot and slugs, and the Fiocchi Aero slug. Pump shotgun’s forend has to be well designed because this action type gets a lot of hard use. M5 is fine in this regard. Double feed described in the text. Bad news and not acceptable. I wish I could give the M5 a clean bill of health, but I cannot. The shotgun is marked 2¾ inch and 3 inch on the receiver and so it should be reliable with 3-inch shells. It isn’t. I had zero malfunctions with around 250 2¾-inch shells regardless of the maker or load. All functioned perfectly. The malfunction rate with 3-inch shells was about four percent—two misfeeds with a little over 50 3-inch shells. While it doesn’t sound like much, four percent in a self-defense firearm is totally unacceptable. So, the shotgun is problematical with certain loads. I have owned handguns that were not reliable with certain open-nose hollow points. I realized later that the ammunition was at fault in the majority of cases. Just the same, the M5 malfunctioned with first quality shells that are reliable in every other shotgun in the safe. These screws and the heat shield can be removed. Head on one screw was damaged from the factory. On the plus side, the shotgun is reliable with 2¾-inch shells and there are plenty of excellent personal defense loads that work well. The finish will probably prove durable in the long run, the action is smooth enough, and the handling characteristics are good. The safety finally smoothed up to a reasonable level of effort but remains tight. When all is said and done, all I can do is damn the M5 with faint praise. The RIA M5 is inexpensive and works once proofed with compatible loads. It’s considerably smoother than most economy-grade shotguns I have fired, and the forend is stable. For the foreseeable future, I will be loading the M5 with Hornady Critical Defense buckshot loads. This loading looks right and shoots right. As for the M5, well, I am not done with it yet. The shotgun has some good features, but for self-defense there are better choices.